Yes, that's what I've been trying to crochet for the past couple of months. 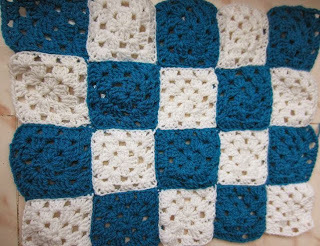 If you're a beginner, you'll surely understand the struggles that a novice crocheter has to undergo before getting it right. Mine was no less..
After making about 20, I pieced them together. It was time consuming but a good learning experience. Emboldened by my granny square crocheting , I wanted to make something really really useful - I had some baby wool,just two colors and one skein each (again thanks to DH). 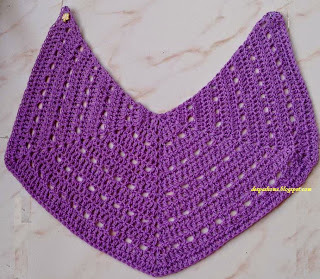 I tried again this time using pattern for Eva's shawl . 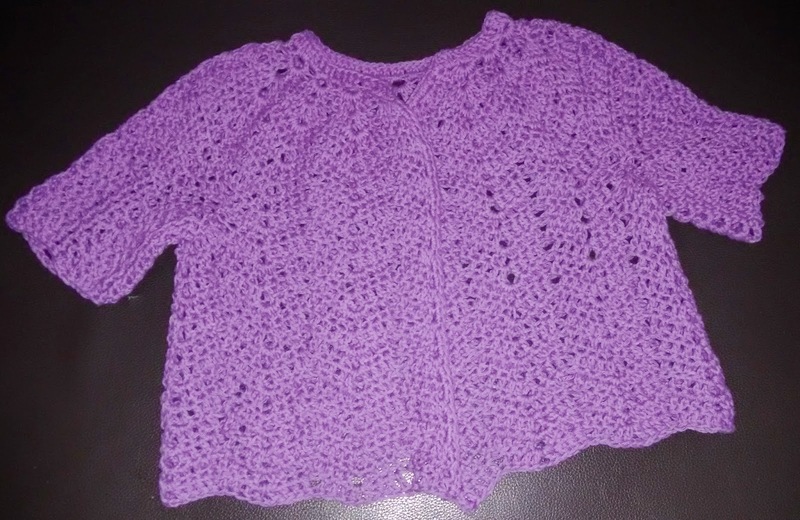 I had read in another blog about how she had converted the shawl pattern to an open shrug. I tried doing that, but did not like the looks of it and let it remain as a wrap for the little lady. The yarn I used is probably thicker and so it did not look lacy at all. Meghna wore it for just a day and it was relegated to the darker corners of the wardrobe. I like the open shshrug, too, even if it is not as lacy as you wished. However, if you still have some yarn left, you could crochet another triangle and join to the 'empty' space, thus making it a hexagon. This can be used as a coffee table cloth, or some such cover. 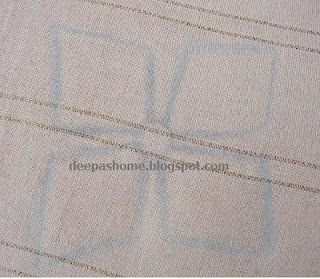 If the dimensions are right, you could use it as a cushion cover ( the front ), sewn on to fabric for the back. I have taken the liberty to share these suggestions only coz I hate any good handiwork (that requires effort, time, creativity, love) being relegated to the closet dungens. I hope you don't mind. Congrats on learning crochet! It's so nice when a daughter wants to wear what you create, love the cardigan. And thanks for sharing the link to the bolero, it looks very nice. 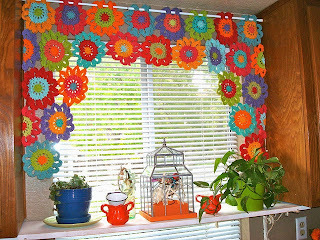 Looking forward to see your crocheted valance! Good for you!! I'm not at all sure I would have had as much perseverance. And lucky you to have a DH that even thinks to get you yarn!! good to see you back on your blog Deepa. You have mastered crochet, and both the shrug and cardigan are lovely. 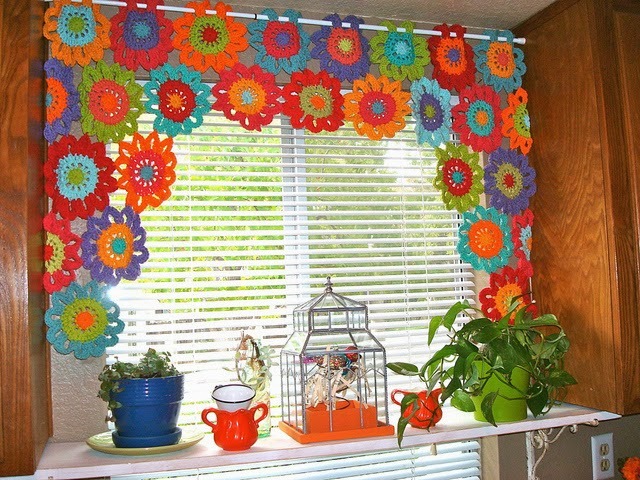 The valance you have plans for is very pretty, best of luck with it.I struggle to crochet and although I get it out sometimes it usually gets thrown back in the box still not mastering it! Firstly, apologies for all the errors in previous comment -- predictive typing turned so 'unpredictive' ! Do check it out and give me your feedback whenever you can. This doesn't look like beginner's work. That cardigan is very cute.